For Christmas this year, I received a few gifts that were camera-related. One that I’ve really enjoyed playing with for the past few weeks has been my Speedlite flash. It’s opened up a whole new world – one in which I don’t have to plan to take all of my pictures for this blog before 4 pm when the sun sets. We’re still very much in the “figuring it out” phase, but I love that I can now photograph our dinners on occasion and share them with you! It’s always bummed me out a little when we try delicious recipes at night in the winter and they don’t make it to the blog, so I’m hopeful that’ll all be changing now. This salmon was one of the first recipes I flagged in the new Barefoot Contessa book when I picked it up a few months ago. I love simple weeknight dishes, and this one definitely falls into that category. 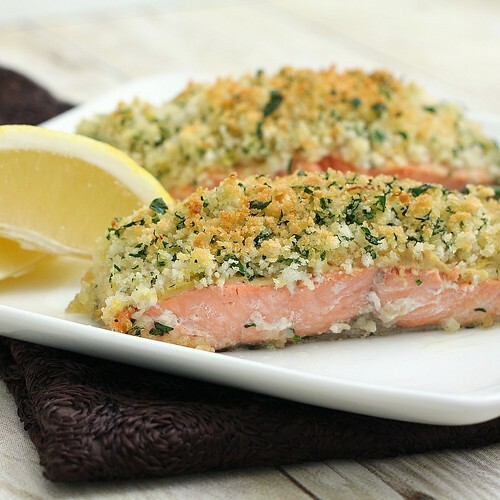 Salmon fillets are brushed with Dijon mustard then topped with a panko breadcrumb mixture before being seared briefly on the stove top and finished in the oven. From start to finish, it’s 30 minutes or less. The dish was a big hit here – the fish was rich with just a bit of tang from the mustard and the crispy panko topping was a nice contrast in texture. I bet it’ll be even better next time we make it, when *hopefullly* I’m more comfortable with the Speedlite so we can eat our dinner while it’s still hot 🙂 Luckily, Shane’s a good sport, as we’ve eaten more than our fair share of lukewarm dinners recently! 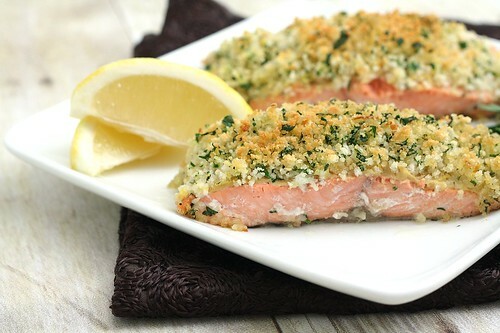 22 Responses to "Panko-Crusted Salmon"
Okay I really must make this now! I received this book for Christmas.I’m beyond generous with my gifts haha.Enjoy the speedlite.. This looks great. I have it marked to try as well. Speedlite, whta the heck is that??? Well, someday I might figure the photography out, right now, it’s all I can do to figure out the cooking/baking. Seriously. Your photos are gorgeous! Lighting aside, I’m intimidated by trying to style most of my savory food. It just doesn’t look as pretty as desserts do. Salmon is one of my favorite weeknight meals, because it’s so good but doesn’t take long to make. This recipe sounds like a winner! What is the speedlite? Salmon looks great..
An excellent dish! One I would not hesitate to make. I’ll be watching for a good price on salmon. I recently purchased that cookbook and I’m looking forward to trying out that recipe! Thanks for the reminder. The picture looks great! Thanks for the great recipe. I made it last night for my family. They loved it. Great photos, Tracey! I think you’re getting the hang of the flash beautifully. This was the first I made from Ina’s new book. It really looks fancy for something that is so quick to put together. I love salmon with all kind of crusts. Definitely shall try this one as well. Great pictures! Congratulations on your new photo equipment! Speedlite is on my list also. Great pictures! This is a terrific way to showcase this dish! The salmon looks divine, and the grated lemon zest is a perfect addition. I’m super jealous of your new flash! I leave for work when it’s dark, and get home when it’s dark, so unless it’s a weekend I’m forced to take pictures with awful lighting and just correct them as much as I can afterwards in photoshop! It’s werid for a man like me but I just love Ina Garten’s Barefoot Contessa. I have learned a lot of recipe. And that Salmon? It makes me hungry! Wow this looks really great. And really easy! I’ll have to try this soon, definitely saving this recipe. Thanks for sharing and beautiful pictures! 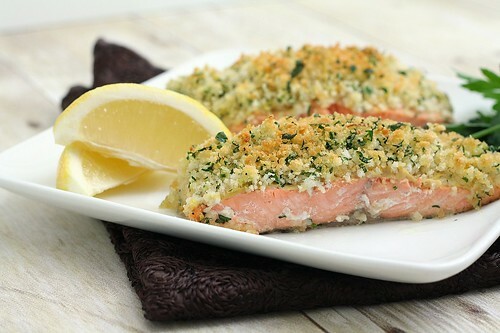 This looks really tasty, I am also a massive fan of panko – can’t get enough of those sharp little breadcrumbs! I love using panko..I usually don’t even have regular bread crumbs anymore! By coincidence, I made this dish in our home Sunday night and this new method to prepare salmon is delectable. Better yet, the leftovers last night were equally delicious. You’ve described the salmon perfectly and your photography is spot on! That salmon looks incredible, and the photos are stunning! Can’t wait to see more of your photos with the speedlite flash! I made this tonight for my parents! Super easy recipe and really tasty! Mine came out a little dry for some reason–maybe it was just the type of salmon? If I do it again, I might bake it for a shorter period (I went the full 7 minutes).